This page focuses on army children during the 1914–18 period: World War I, also known as the First World War and the Great War. This was a time when many British youngsters became ‘temporary’ army children upon their normally civilian fathers becoming soldiers, some having joined the British Army because they volunteered, and others (from 1916) because they were conscripted into it. This page therefore broadens TACA’s focus beyond the children of regular soldiers to encompass those of all British soldiers between 1914 and 1918. As a member of the First World War Centenary Partnership, led by IWM (Imperial War Museums), TACA has also established the ‘The Army Children of the First World War’ project. Click here for a summary of the project posted on the First World War Centenary’s 1914.org website, and see below for further details. In addition to the photographs being posted in the ‘The Army Children of the First World War: Faces and Families’ Flickr set, note that you’ll find more on TACA’s ‘Forgotten faces’ page. During the First World War, an enormous number of British children became ‘temporary’ army children when their civilian fathers joined the British Army as volunteers or conscripts. A significant proportion of British families today will count such children among their ancestors, but may not appreciate fully how having a soldier–father affected the lives – psychologically, as well as practically – of their antecedents. The Army Children Archive (TACA) collects, preserves and shares online information about the history of British army children and the challenges and peculiarities of growing up as the child of a regular soldier in the British Army, from the seventeenth century to today. Because the wartime experiences of the children of volunteer and conscript soldiers essentially mirrored those of the children of regular soldiers from 1914 to 1918, TACA is in a unique position to provide a deeper understanding of what they went through. Drawing on the wealth of material that it has gathered, TACA additionally encourages consideration of the many ways in which the war affected these young non-combatants. TACA highlights the plight of the army children of the First World War primarily visually, using two online galleries of images accessed via Flickr, as follows. ‘The Army Children of the First World War: Faces and Families’ consists of a set of photographic portraits of army children and their families photographed between 1914 and 1918. Ten images have initially been posted, after which further images will be added weekly. Any known information about the faces and families pictured, or any clues offered by the photographs themselves, accompany the images. Viewers are invited to fill any information gaps and, if possible, to identify these forgotten faces. 2	‘The Army Children of the First World War: a Sentimental View’ displays a selection of First World War-era sentimental postcards and ephemera featuring army children, and children generally. Many of these images were intended to tug at the heartstrings; others, to arouse patriotic feelings; another category reflects, through the prism of childhood, national preoccupations during the Great War. The initial ten images will similarly be augmented weekly. Regular updates on the progress of the ‘The Army Children of the First World War’ project will be posted on the ‘TACA drum’ blog. The Army Children of the First World War’ project has been established by TACA as part of the First World War Centenary Partnership, led by IWM (Imperial War Museums). The First World War Centenary Partnership is delivering a global programme of events and activities inspiring young and old to connect with the lives, stories and impact of the First World War. For more information about the project, follow this link: http://bit.ly/ArmyChildrenFWW. Europeana 1914–1918 kindly invited TACA to write a guest blog post about the images from 'The Army Children of the First World War' project that we are contributing to it, and Clare was delighted to oblige. So here’s something about the project’s growing collection of pictures, and about how interesting comparing and contrasting these images with other contributions to Europeana 1914-1918 is turning out to be: ‘If father’s gone, keep smiling” – considering the children of the First World War’. 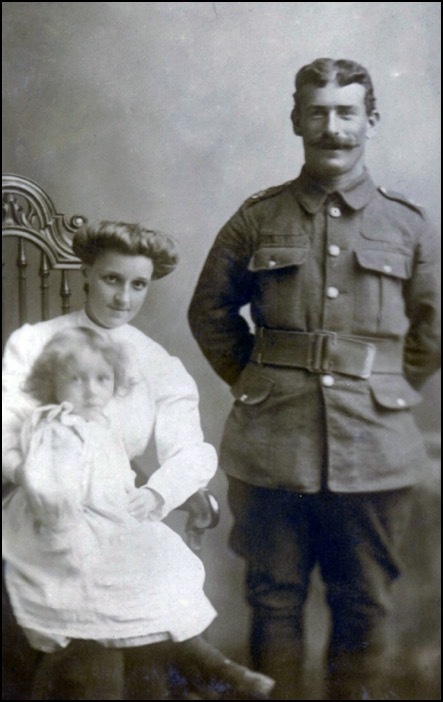 Thanks to the help of the Shropshire Star newspaper, a lady with local knowledge and an excellent memory, and some research on our part, we have identified the family of a First World War soldier photographed in Welshpool. Click on the link to read more: http://bit.ly/ACFWW228. 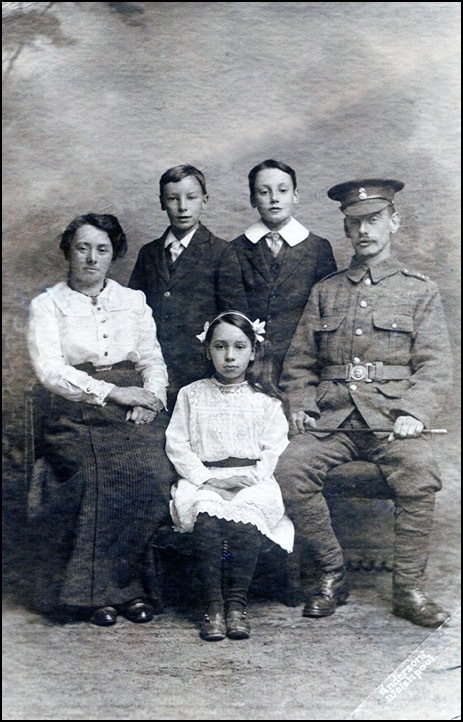 We are delighted to report the successful identification of the family pictured in the hundred-and-fifty-seventh photograph, below, in ‘The Army Children of the First World War: Faces and Families’ album. We are indebted to David Hatherell, of Bexhill Museum, and the Bexhill-on-Sea Observer for the part that they played in putting names to faces. Click on the link to read more: http://bit.ly/Balls157. ‘I recently gave a talk on a local First World War army unit. A gentleman in the audience shared with me his papers on his grandfather, who served with the unit. The youngest subject in this June 1918 image is Thomas George Cornford, born on 30 April 1918 in Bexhill [in East Sussex]. He went on to marry Ivy Stockford in 1944 and had three children: Michael, Susan and Nigel. He served in the Territorial Army prior to the Second World War. He worked as a plasterer living in Bexhill. He died on 13 June 1986, in Croydon, en route home from holiday. David revealed ‘our generous donor’ to be Mick Cornford, who confirmed that he and his sister were happy for us to share their family photograph with TACA’s visitors. We are immensely grateful to Mick and Susan, and also to David, for enabling us to do so, and send thanks to all three. Thanks to the help of the Richmond & Twickenham Times and volunteer researcher Ruth Marler, we have been able to identify the subjects of the hundred-and-twenty-fourth photograph in ‘The Army Children of the First World War: Faces and Families’ album. Click on the link to discover more: http://bit.ly/ACFWWFF124. Above: Joseph, May and Mary McAvoy. We certainly did! 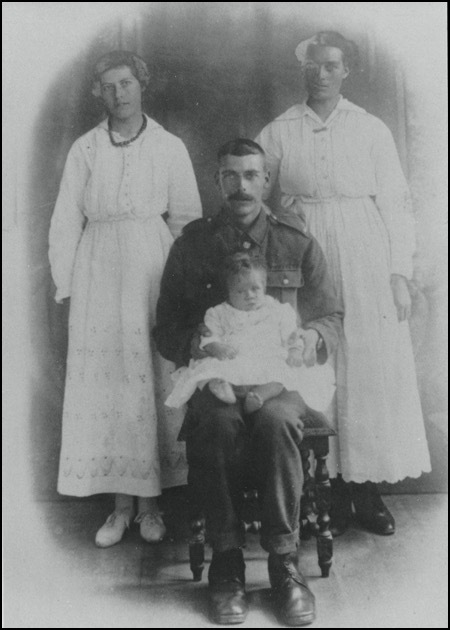 Indeed, we were delighted to have our first photograph of a Northern Irish army family of the First World War. Sadly, it isn’t possible to ascertain Joseph’s regiment from the photograph, but entering his name into the National Archives' British Army medal index cards 1914-1920 database suggests that he may have served in the Royal Irish Rifles. 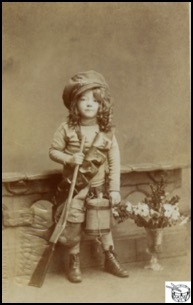 ‘In the photo is my great-grandfather, Joseph McAvoy (b. 13 April 1882), my great-grandmother, Mary (b. 1884? ), and my paternal grandmother, May (b. 7 January 1914). Joseph was a dispatch rider. He experienced many gas attacks, which caused him to suffer from dropsy, with which he continued to live until his death on 18 October 1943. May, at the age of sixteen, married Samuel Beggs on 12 November 1930. She gave birth to Samuel (b. 22 February 1931, d. 18 October 1982), my dad, Joseph (in June 1932), and then a daughter, Mary (in August 1933, but she died on 31 January at five months old). May was diagnosed with tuberculosis (TB) and was confined to 25 Ashfield Street, where she died two weeks later, on 30 August 1933. Her father was by her side. Samuel lived on into old age. He never married again. If you can add any more to this family’s story, please contact TACA, and we’ll pass on your message to Denise, to whom we are most grateful for sharing this insight into her family history. The Last Post project is a music and memory project for the First World War centenary that brings communities across the UK together to play the ‘Last Post’ in memory of those affected by the First World War. This year, Last Post week will take place between 20 and 26 April, and will commemorate the Gallipoli campaign, which began on 25 April 1915. Anyone can register their event with the project, and anyone can download the Last Post Gallipoli resource pack, which contains worksheets and information about Gallipoli for young people and schools. Click here for further information. 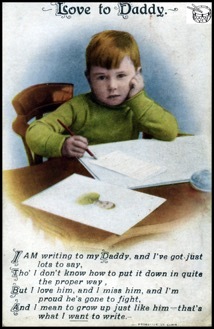 ‘As you have a copy of the “Dreaming of Daddy” postcard on Flickr, I thought you might like to see another copy. Here are scans of the one found on my great-grandfather’s body. He was James McCarthy, 6184, C Company, 1st East Lancashire Regiment. He died near Boesinghe, Belgium, on July 6, 1915. The postcard was supposedly written by my grandmother, Annie McCarthy, but she was only three at the time, and may have had just a bit of adult assistance, perhaps from her mother, Catherine McCarthy. 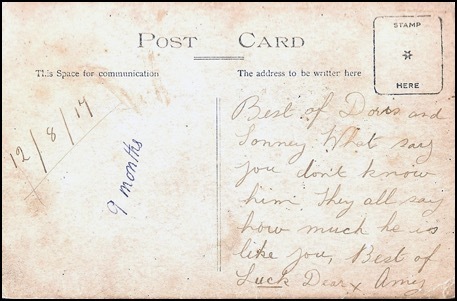 The postcard is addressed to “James McCarthy / No 6184 C Coy / 1st East Lancs Regt / 11th Brigade / 4th Div / Expeditionary [?]”. The message reads, “Dear daday just to let you no I am longing to see you. Dear daday you have been a long time away from your own little Annie and John and Jimmy. To my darling dady Annie McCarthy”. Annie’s father was set to come home on leave about two weeks after the day he was killed. That would have been the first time he’d been back in England since the war started in August 1914. He never did see his youngest son . . . 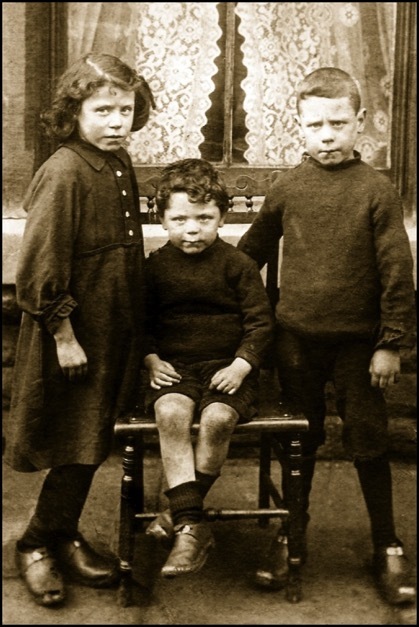 Above: A photograph of the now fatherless children, Annie, John and Jimmy McCarthy. To read more of this tragic story, click here. 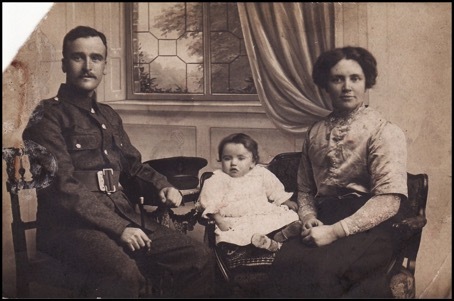 TACA is immensely grateful to Gary for sharing such a poignant personal insight into the devastating effect that the First World War had on many families. 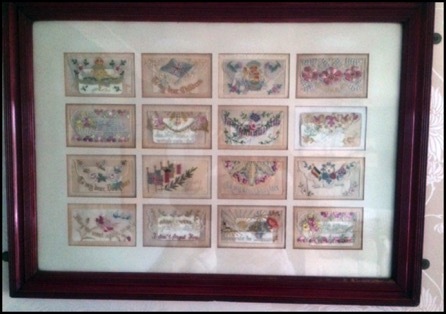 ‘My silks were sent from France by my maternal grandfather to my grandmother between 1915 and 1918 [see below]. 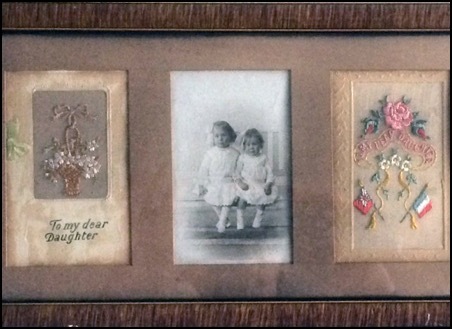 The small frame carries two more silks and the photo my grandfather carried of his small daughters [below]. 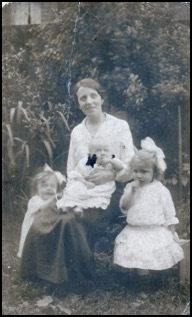 My mother, Doris (b.1917), now 98, is the younger girl, and my late aunt Lizzie (1915-18) is the elder. Both girls caught diphtheria in the outbreak of 1918 - oddly, my mother survived. Rather poignantly, the note in the silk tells Lizzie to get well, but by the time this reached the UK, she had already died. The gold brooch pendant [below] also carries his picture; my granny wore it every day until he returned to the UK after the Armistice. I am very proud of my silks and the family story behind them. 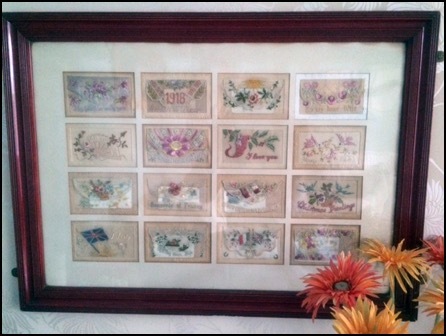 It is a testament to their importance and their contribution to maintaining the links with home during World War I that my grandparents chose to have them professionally framed. 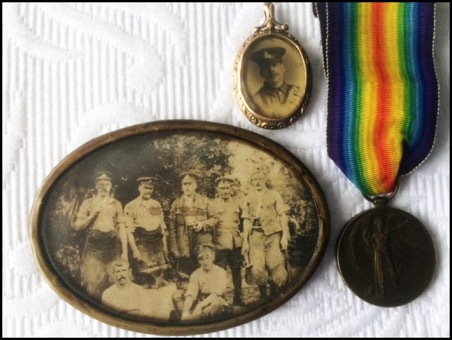 TACA is immensely grateful to Jacqueline for choosing to share with us the story behind her family’s treasured mementoes of the First World War, and of those two small army children, Doris and Lizzie. Jayne Shrimpton is a professional dress historian and picture specialist who has published many books on how to date photographs using fashion clues. We have certainly found them invaluable when it comes to dating photographs for TACA’s ‘Forgotten faces’ page. 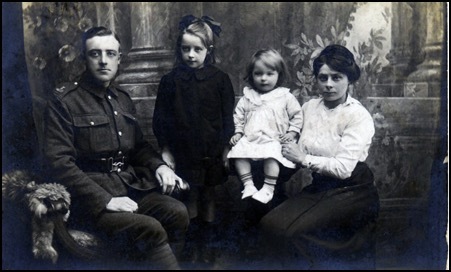 TACA is now further indebted to Jayne for contributing two family photographs to our ‘The Army Children of the First World War’ project. ‘These two family photos (right and below) were evidently taken on the same day: 12 August 1917, according to a handwritten note on the back of one of the postcards. 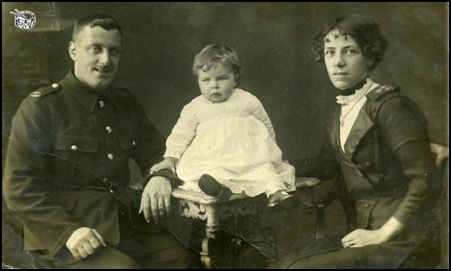 They show my dad as a baby, with his sisters and mother, while his father, a soldier, was away at war. They are the only photos we have of our father when young. We know so little about his early background, not having asked the right questions when he was alive. It looks as though the photos were taken by a professional photographer, hired to visit the family at home in north London. My father, William George Shrimpton (known as Bill – or “Sonny” – by his family), is the baby; he was born in November 1916 and died in August 1999. 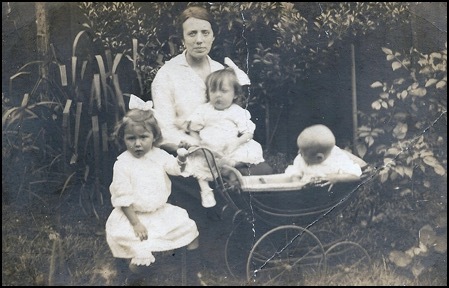 His sisters, pictured here, are Amy (born in 1914) and Doris (1915). Three babies in three years – their poor mother! She was Amy Shrimpton, née Brooks (1882–1972), and their absent father was also named William George Shrimpton (1883–1957). 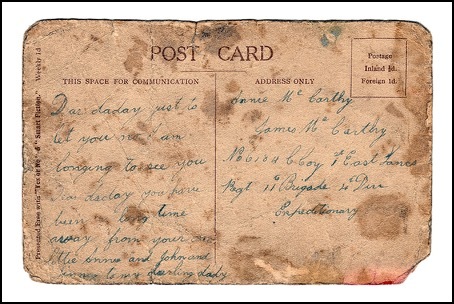 There is a handwritten note on the back of one of the postcards (below) that appears to be a message from my grandmother to her husband, away at war, presumably. It reads, “Best of Doris and Sonny. What say you don’t know him. They all say how much he is like you, Best of Luck Dear x Amy”. It implies that he had not yet seen his baby son, “Sonny”, who had been born nine months earlier. That really choked my sister and me, as it hadn’t really occurred to us that Dad’s father was absent for the first two or three years of his life. Jayne’s fascinating website – www.jayneshrimpton.co.uk – is well worth a visit, as is her blog: http://jayneshrimpton.tumblr.com. 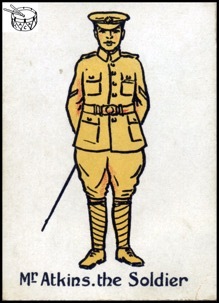 Following in the tradition of previous ‘families’ card games (see, for example, two items on the ‘History matters’ page, ‘PICTURES: MISS AND MASTER TOMMY ATKINS, c.1910’ and ‘FROM THE NAVAL AND MILITARY FAMILIES CARD GAME: EIGHT ARMY CHILDREN DEPICTED ACCORDING TO EARLY TWENTIETH-CENTURY STEREOTYPES’), the four cards reproduced below portray the members of a stereotypical army family. 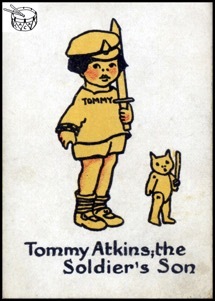 Given the surname ‘Atkins’ (after ‘Tommy Atkins’, a name used since the nineteenth century to describe a typical British Army private soldier), the family headed by ‘Mr Atkins.the Soldier’ (who appears to be a corporal) comprises his wife and their children, Tommy and Lucy, both army children being depicted with appropriately martial toys. 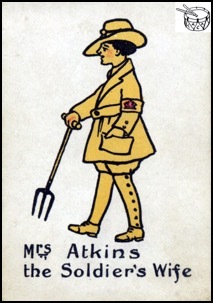 Their uniforms and clothing date the set of cards to World War I, and it is notable that Mrs Atkins is wearing the uniform of the Women’s Land Army (WLA), which was established at the start of 1917. 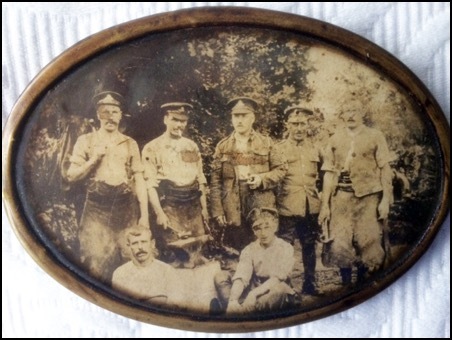 Many recently married couples who had just started a family between 1914 and 1918 had themselves photographed together before the father of the family set off for the front, like the family below, in which a small hand can be seen clutching the soldier’s left arm for support. 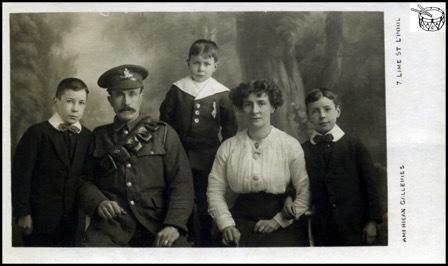 Poignant images and photographs like these make one wonder how many fathers returned to rejoin the family ‘unit’ at war’s end, and, even if they did, how their children’s lives changed as a result of their father’s experiences as military men. 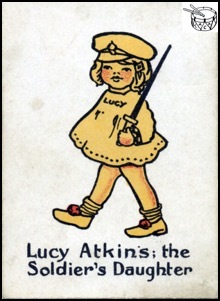 The Birmingham-produced postcard below dates from World War I, and was purportedly written by a patriotic British army child. Soldier–fathers had been among those sent to France from the outbreak of World War I in August 1914 as part of the regular army – the British Expeditionary Force – with more following in their footsteps as volunteers. Conscription was introduced for single men aged between 18 and 41 in March 1916, married men of the same age group joining their ranks in May 1916, with the age bracket being extended to 17 to 51 in April 1918. 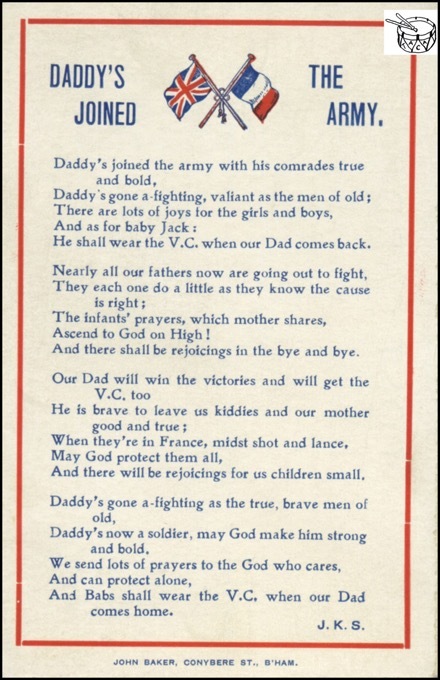 During the four years that the war lasted, countless children would consequently have been affected by their fathers’ participation in the conflict, if only through their absence from home, which few would have experienced as ebulliently and optimistically as the child who supposedly composed ‘Daddy’s Joined the Army’. On Remembrance Day, as well as remembering those military men and women who died in the line of duty, TACA bears in mind the youngsters of all eras whose childhood has been adversely affected by armed conflict, be it directly or indirectly. 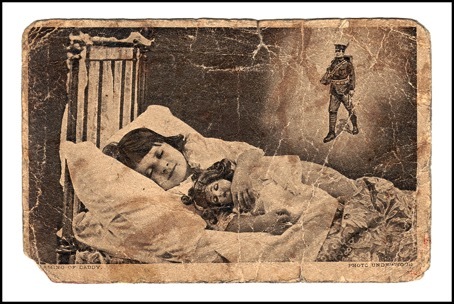 The World War I-era postcard reproduced below may be steeped in pathos, yet accurately illustrates just one of the devastating effects that war can have on family life when a soldier is also a parent. 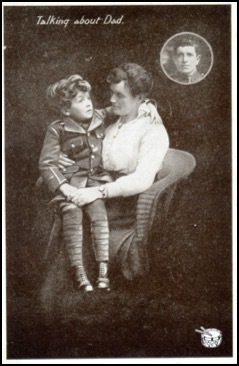 The poem entitled 'To Tony – Aged 3' was written in 1918 by Marjorie Wilson in memory of her brother, T P Cameron Wilson ('T. P. C. W.'), a casualty of World War I. Also a poet, he was serving as an officer in the 10th Sherwood Foresters when he was killed in action at Hermies, France, in 1918. Many of the children of soldiers killed in combat were – are – too young to know or remember their fathers, so it falls to relations tell them about their parents and of the sacrifices that they made. 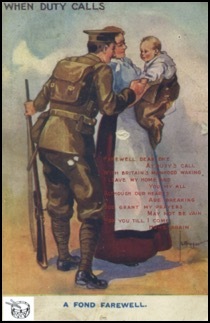 Below: A World War I-era postcard. And he had praise for every beauteous thing. A pair of images dating from World War I illustrates the cost to families – sometimes temporary, sometimes permanent – that is inevitably paid when a soldier goes away to war. When the golden sun sinks in the hills / And the toil of a long day is o'er / Though the road may be long, in the lilt of a song / I forget I was weary before / Far ahead, where the blue shadows fall / I shall come to contentment and rest / And the toils of the day will be all charmed away / In my little grey home of the west. / There are hands that will welcome me in / There are lips I am burning to kiss / There are two eyes that shine just because they are mine / And a thousand things other men miss / It's a corner of heaven itself / Though it's only a tumble-down nest / But with love brooding there, why no place can compare / With my little grey home in the west. 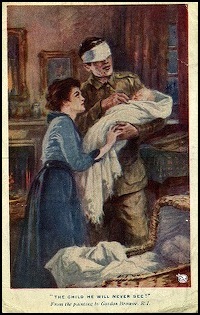 The first image, above, is a postcard that shows a soldier dreaming of returning home from the front to be reunited with his wife and children. 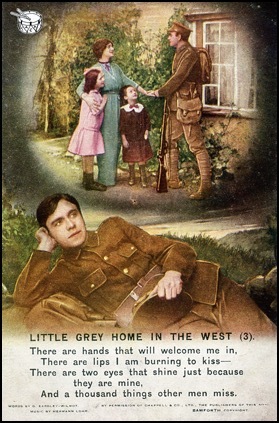 The text below him is taken from the song 'Little Grey Home in the West' – the postcard is the third in a series of four – whose lyrics were written by D Eardley-Wilmot in 1911 (you can listen to an original recording of the song on the firstworldwar. com website). The second image, on the right, is a studio portrait of a mother with her two children. 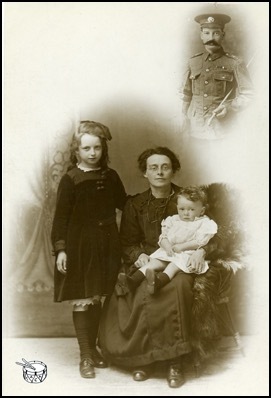 The mother and eldest daughter's dark clothes, along with the inset photograph of a uniformed soldier, suggest that this is their husband and father, who did not return from the front, but died in the line of duty. He is now with his family in spirit only.